The S&P’s debt rating service projected a poor credit rating for the U.S. today. With this big news, the markets tanked. We pulled up a couple of charts to see how the Atlas Line performed for traders in two separate markets: the E-Mini S&P and Crude Light. 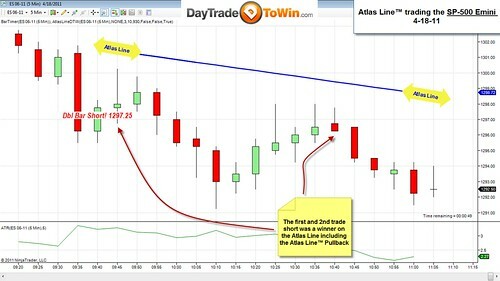 The Atlas Line was spot on in the E-Mini S&P, advising two short orders. The first order was a Double Bar Short, the second, an Atlas Line Pullback Trade. 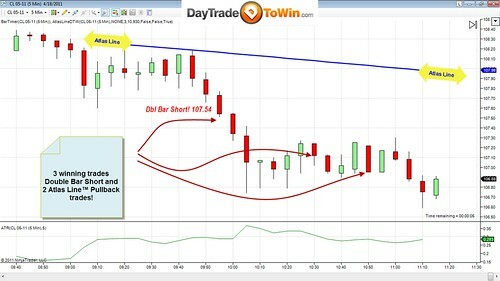 In case you don’t know what a Pullback Trade is, John Paul teaches traders how to identify them in the webinar included with purchase. Three winning trades. First, a Double Bar Short signal followed by two Pullback trades. When news about the U.S. comes out that is revered with such high importance, there’s a great effect on all markets. We recommend waiting until the news event volatility has subsided before using price action software like the Atlas Line. Sign up for a webinar to see how the Atlas Line is traded – visit the registration page.